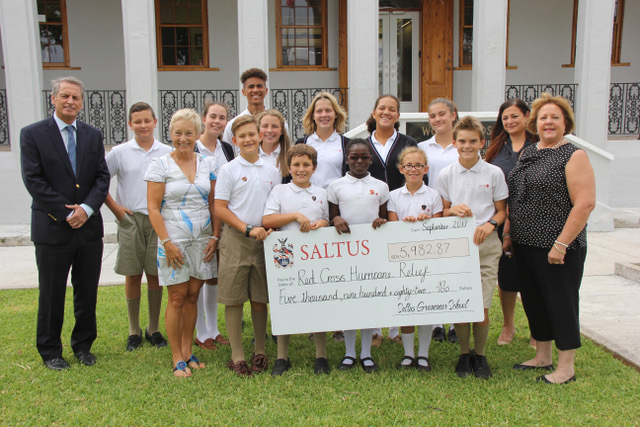 Saltus Grammar School raised just over $6,000 from students and faculty to assist Bermuda Red Cross with their Hurricane Disaster Appeal that is supporting the victims in the Caribbean. Ann Spencer-Arscott, Executive Director for Bermuda Red Cross, said, “We are so pleased with the outpouring of support we are getting from the community. As an Alumni, I am particularly proud of the effort that students and faculty made to support our Hurricane Disaster Appeal. “As the American Red Cross did not request international assistance, we are not providing any financial assistance to any of the US territories. If people wish to support the US islands affected by the hurricanes, they can do so through American Red Cross. “In the first 3 – 6 months during the recovery phase the money will be used by Red Cross on each Island to help those in the shelters by providing food, water, hygiene kits, as well as purchasing tarpaulins, mosquito spray, flashlights, and kitchen sets. Additionally, other concerns after such a wreckage are compromised water systems and ensuring health facilities are operational. “Because of the sheer numbers of people who have lost homes, money is also being spent on purchasing cots and other bedding supplies for the shelters. Should we be requested to continue with our disaster appeal for the Islands, then additional funds will be used for the rebuild phase when the money will be provided to people to purchase materials to rebuild homes and possibly even for furnishing the homes, depending on insurance. “As well, personnel who are experienced in logistics, psychosocial issues, distribution of Red Cross relief supplies as well as cash delegates who work with the local communities to provide work opportunities to residents to assist with clearing and rebuilding. Many thanks to all involved! !